Some fifty plus years ago there was a young four and a half year old girl who lost her father in an air crash. She did not know much except for the fact that her father was no more and there had been an air crash and lots of fire. It was no wonder that from here on most of her dreams culminated in a nightmare where everything was engulfed in fire. She would wake up scared and hated trying to go back to sleep terrified lest the same fiery dream engulf her over and over again. Then, one day, she went with her mother to the Ashram and met the lovely kindly enlightened soul who was her Mother’s Guru Ma. Guru Ma looked down at her and asked her who amongst all the Gods was her particular favorite. “Krishna”, came the prompt response. “Why don’t you call him and keep him by your side, when you are scared? He will take care of you.” Guru Ma said, as she smilingly patted the little girl’s head. From that day onwards, her little brass idol Krishna became the girl’s talisman, he kept her company, soaked up her tears, wiped away all unreasonable fears and took away any nastiness that threatened her. She would sneak him off, from her Grandmother’s altar, and take him on walks, to school, to the examination hall, almost anywhere when she was scared or when she needed courage. Every year, since then, I have celebrated Krishna’s Birthday “Janamashtami” by observing the fast and making special clothes, foods and even a little cradle for him. My little idol, the receptacle of my faith, has steadfastly been my companion through the ups and downs of life. This year was no different from others plus I had the urge to try out something a little different from earlier years. Being a diabetic I wanted to avoid too much sugar and yet not sacrifice taste. My culinary journey this time lead me to a milky rich paneer that I have named “Gopal Bhog”!!! A mixture of candied and dried fruits and nuts for decoration. Mix the regular and almond milk together with the cardamoms, in a heavy bottom pan and bring it to boil. Keep stirring regularly to avoid the milk catching at the bottom of the pan. 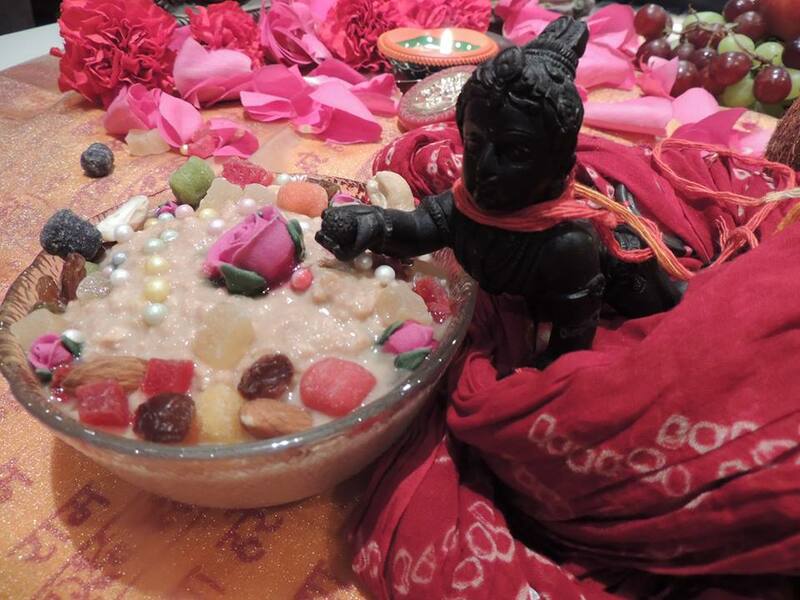 (You can use just milk but the addition of Almond Milk helps in sweetening the Bhog and adds a different dimension to this sweet offering). Keep the milk mix steadily boiling for at least an hour, if not more, until it is reduced to almost a quarter of its original volume and looks thick and creamy. Make sure you stir regularly and incorporate any “skin” that forms on top, back into the mixture. As you mix this in, scrape the sides of the pan too. When you feel that it is reduced sufficiently (You can choose to remove the cardamoms at this stage), add paneer and continue to cook for six or seven minutes stirring frequently. Add the almond meal and slivered almonds and cook again for 4 to five minutes. Finally add the sugar and boil for a couple of minutes. If using sweetener, turn off the heat and then add the sweetener. Remove to a serving dish, sprinkle with rose water and garnish with a mixture of dried and candied fruits and nuts.